When it comes to the Ukraine crisis, it is worth looking into what positions the main actors have been in and whether they have distinctive patterns of behaviour. The conflict of the views and aspirations of the major players which was triggered by the events in Ukraine is already affecting the fundamental principles of the world order as it had been conceived of over the past two decades. It is a long way to the end of the confrontation and the most dangerous phase is ahead – the events surrounding the scheduled 25 May presidential elections. It is worth looking into what positions the main actors have been in and whether they have distinctive patterns of behaviour. The situation is at a stalemate in Ukraine. The government is incapable of dealing with the disorder and solving the country’s economic problems. The “people’s republics” in the east cannot present themselves as a responsible power based on the majority of the local population. The actors represented on stage and behind the scenes are unable to switch over to the settlement of the regime. And it is not just a matter of serious mutual hostility. There is a need for a common framework. Ever since the tragic events in Kiev in the latter part of February, the legal field has been destroyed and each and every action only worsens the situation. Legislative norms first collapsed under the pressure of coup and then were replaced by the boomerang principle – “if you can do it, so can we.” In conditions of an heterogeneous country, split by cultural and historical differences, this brings about a rapid polarization. Maidan is answered with anti-Maidan, nationalistic groups engender anti-fascist groups, attempts at the monopolization of centralized power by one group results in the alienation of others and the right to self-determination of the Ukrainian nation is reflected in mirrored operations in the Crimea, and so on. The democratic procedures (elections) invoked for bringing the process back into the legitimate framework are themselves outside of it because they do not solve the problem, but worsen it. However, without elections, Ukraine will plunge into a legal vacuum for good. The valid version would be that any elections be preceded by the process of national reconciliation like the Polish “Round Table” of 1989 or by a constitutional assembly. But it is not clear on what basis its delegates are selected. The collapse of the political system and loss of internal support has created a funnel through which foreign powers are literally sucking and they are responding to the calls of those whom they see as corresponding with their interests. The reunification of Crimea was a unique event for Russia having a separate historical-psychological motivation, and Moscow’s drive for territorial acquisition appears to have come to an end. 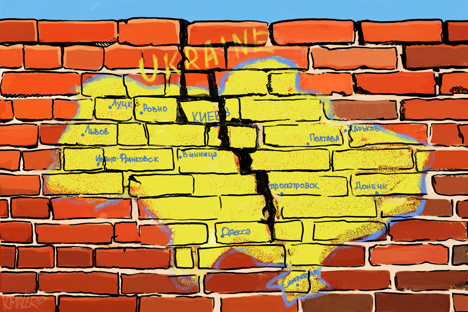 The long-term goal is the restructuring of Ukraine in order to deprive it of the chance of turning into a state with a consolidated anti-Russian sentiment. Supporting the actions of activists in the east fits into the overall logic of Russian foreign policy. Despite allegations of the mass presence of Russian “agents” in southeastern Ukraine, convincing evidence has yet to be produced. However, the firm intention to avoid the defeat of the “self-defence forces” is not hidden. The failure of the self-defence forces will be taken as a failure of the Kremlin, so Russia cannot take a distance from these groups. The anti-Kiev movement of southeast Ukraine is considered in Moscow as a guarantee that during the restructuring of the state chassis it will be necessary to take into consideration the interests of the citizens of this part of the country and those of Russia. However, the entrenched confrontation in Ukraine is just one stratum in the grand game. Moscow’s actions have met with staunch disapproval by the West and the confrontation is irreversible. Russia is entering into a relationship with the West similar in psychology to that of the Cold War. Inertia reigns for the moment, but soon a restructuring of the system of international relations and an adjustment of the economic model favouring the rejection of integration into global markets will be necessary. It is not clear how accurately the Kremlin has calculated the economic impact, but the response of the West was taken into account and the damages estimated as tolerable. Moscow’s goal is to rigidly fix the “red line” that was drawn in the post-Soviet period, as well as dramatically improve its status on the eve of the formation of the new world order. Russia will not back down on the Ukrainian issue. The decisiveness in Crimea not only demonstrated the seriousness of the mood but also largely cut of the way for retreat. Lowering the stakes is impossible now. The European Union bewildered. It cannot find its natural position in the conflict surrounding Ukraine. Power politics is not part of its profile and in no way can it take an independent position. And even though by the logic of the EU itself it should put the utmost effort into resolving the Ukrainian crisis, it has lost the initiative. Europe is not ready for such a drastic change of scene. After the Cold War, the Old World got used to occupying a comfortable position where it did not especially fear Russia but did not allow confrontation and had the opportunity of enjoying the benefits of cooperation. The Kremlin’s actions have shocked Europe, awakening all its historical phobias – the fear of repeating the nightmares of 20th century European history, from world wars and the redrawing of the borders to the split of systems under the nuclear gun. The United States, whose Ukrainian policy was up to the beginning of the year relegated to the buying of certain less than central figures, is now forced to immerse itself completely. The reason, of course, is not in Ukraine itself, but in the fact that America has met with tough and uncompromising resistance to its actions for the first time in many years. Washington did not expect such a powerful response from Moscow. As a result its perspective has changed. Up until the Ukraine events, the US considered Russia a headache but not a fundamental problem. Now, if in Russia a proper rival is not seen, then at least a contender for the role of a challenger is. Washington will not be delving into the chemical composition of the Ukraine’s murky internal politics, so is a clear schemata for the way forward: a perhaps imperfect but democracy-loving nonetheless government which rode in on the wave of a resistance to tyranny and bandits inspired and guided by the heirs to the “evil empire.” By using sanctions against Moscow, the United States expects to force a change of course. The chance of this is negligible and the pressure will have to be ramped up leading to a more comprehensive containment. Since the affair is not about Ukraine, in principle, the standoff will expand. Sanctions against Russia may have a long term effect as well. United States has for the first time so clearly demonstrated that it is definitely the main controller of the world economic system. The Visa and MasterCard payment systems can “shut off” financial institutions falling under American sanctions; global IT companies are willing to terminate relationships with “undesirable” clients. Such actions have been undertaken before but applied to countries many times inferior to Russia in terms of political and economic weight and less included in the global economy. Using this method in relations with Russia sharpens the issue faced by the large powers not allied with the USA: can we rely on a global economic system (and global systems in general, for example the internet) if it is so easy for dominating powers to meddle with it when it suits their interests? On the backdrop of the tendency to the segmentation of the world trade and financial space, the pressure of such sanctions can only stimulate the multipolar restructuring of the world – not only political but also economic. Looking at this gigantic palette, it is even strange to recall the smallness of its beginnings. Was Viktor Yanukovich capable of imagining what genie he would be letting out of the bottle when six months ago he postponed signing an agreement of association with the EU?